We propose a novel approach for fusing multi- resolution stereo and motion (both rigid and non-rigid) analysis in order to complement each other’s perfor- mance. A hierarchical frame-work is presented to couple motion correspondences and stereo correspon- dences in order to generate accurate disparity map and motion parameters. One scenariofor such system is the analysis of time-varying multa-spectral obser- vations of clouds from meteorological satellites. Our experiments involve such time-varying remote sens- ing stereo data sets, and the motion is typically non- rigid as the clouds undergo shape changes. Rigid mo- tion matching may still be performed for initial fu- sion, and gradually raised to non-rigid motion match- ing as in a coarse-to-fine strategy. Both stereo dis- parities and motion correspondences are estimated us- ing such multi-resolution coarse-to-fine strategy to a sub-pixel accuracy. 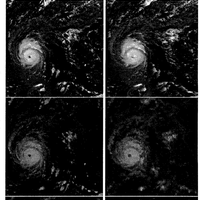 Experimental results using time- varying data of visible channel from two satellites in geosynchronous orbit is presented for the Hurricane Fred eri e.
C. Kambhamettu, K. Palaniappan, and A. F. Hasler. 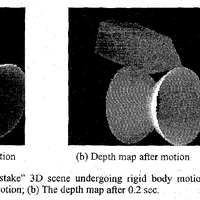 Coupled, multi-resolution stereo and motion analysis. IEEE Int. Symp. Computer Vision, pages 43--48, 1995. K. Palaniappan, C. Kambhamettu, A. F. Hasler, and D. B. Goldgof. 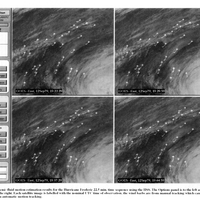 Structure and semi-fluid motion analysis of stereoscopic satellite images for cloud tracking. Proc. 5th IEEE Int. Conf. 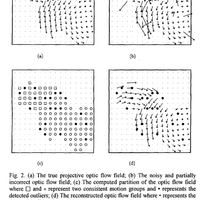 Computer Vision, pages 659--665, 1995. One of the most difficult aspects of developing com- putational algorithms for stereopsis that match the intrinsic capabilities of human vision is the correspon- dence problem; that is locating the same point, if it exists, in multi-viewed time-varying sensor measure- ments. Correspondences have been determined us- ing feature-based or region-based matching algorithms with bottom-up or top-down implementations . The bottom-up or low-level approach for stereo analysis in- cludes: i) extracting feature points or area measures in both views, ii) matching the feature points or area measures under certain geometric, illumination, re- flectance and object constraints, and iii) computing a depth or height map using the disparity values from correspondences using sensor geometry and scanning configuration. 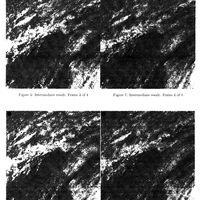 Most stereo algorithms invariably pro- duce errors due to noise, low image or feature content, geometric distortion, depth discontinuities, occlusion, illumination and reflectance changes across the scene and between views, transparency effects leading to multiple matches, and instability of the cameras and sensors during image formation. Such model viola- tions are difficult to handle in a comprehensive fash- ion. Robust statistical methods have recently been applied to a variety of computer vision problems in- cluding motion estimation [lo] [ll][S],surface recovery from range data , and image segmentation . Ro- bust methods offer a powerful alternative to smooth- ness and regularization constraints to mitigate the ef- fects of model errors. A new multistage adaptive ro- bust (MAR) algorithm combined with a multiresolu- tion coarse-to-fine matching model is developed for ro- bust stereo analysis. K. Palaniappan, Y. Huang, X. Zhuang, and A. F. Hasler. Robust stereo analysis. IEEE Int. Symp. Computer Vision, pages 175--181, 1995.